Everything I wanted in a lab coat ever since I started medical school and more. Suleman Bhana, MD, Michael Laccheo, MD, and Paul Sufka, MD recently reviewed the Laennec iPad lab coat by Medelita on May 9, 2013 edition of their podcast, The Rheumatology Podcast, "Episode 11 - SLICC lupus criteria and a better white coat." We have included our own transcription of the podcast segment below: Why bother getting a white coat now when I am long past residency and fellowship? You want people to know you are a doctor. Yeah, I mean it's kinda like a catch 22, I noticed that when I started my position here in New Jersey….I work for a hospital group. The hospital does issue lab coats. I am a vertically challenged individual, so getting something for me to fit even in day to day clothes is not easy. So you can imagine for a lab coat which is designed to be very cookie cutter, I simply could not get a size that fit. So there was a problem just wearing it because it looked like I was wearing a gigantic sheet wrapped around me. Almost like I was back in Roman Times. Other problem was that I have a young son, he's three years old and my job - not that the tie is required but kind of a expected part of my attire, and the tie itself is not obviously a clean clothing object for me to have on so I'd rather keep it kind of tucked out of the way - and when I'm engaging in patients that have some kind of covering on me that not all of my clothes are exposed. Kinda my OCD sort of neurosis that are coming out. 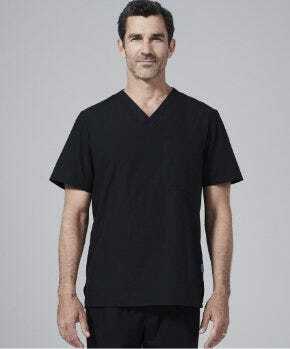 Not that I don’t mind examining my patients or whatever I want to make sure it is at least in a way that my clothing underneath doesn't consistently brush up against or particularly when I am doing procedures. That was a problem to be solved and I couldn't really find a white coat that the hospital issued that really fit well or didn't make me look like a first year resident that I kept getting confused with. Or nurses would ask me to write orders for diets on patients who had just come back to the floor. Much to their surprise I'd tell them that I had no role in that care. So, one thing I kept remembering was in the show House about how nice the lab coats looked on all these physician actors or actor physicians who were wearing them. 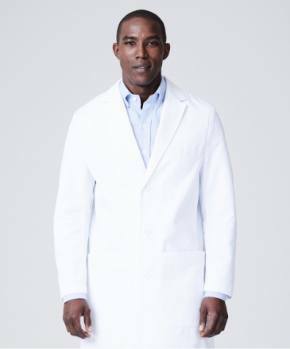 I kept thinking there is no way these are standard issue lab coats - that these things look way to fitted, way to nice, and they fit these people way to well. So, they are a lot better looking than we are. That's a very good point. And they get paid a lot more probably. But, still does art imitate life? Or does life imitate art? So is there anyway for us to obtain such nice looking attire in our professional lives? And think about when we are going out to dinner wearing a nice outfit and we spend some time finding that outfit and looking good. You only feel as good as you look or vice versa. So has anyone come along to kind of meet these superficial desires of the stylish-wanting physician? 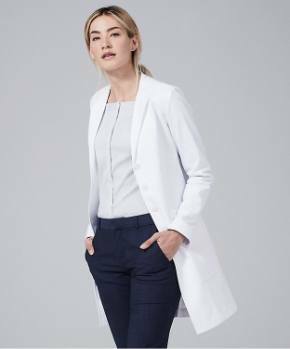 So luckily I did find a company online called Medelita, that's spelled M-E-D-E-L-I-T-A, so medelita.com and they have a mens and womens section where they sell various types of lab coats, scrubs and other types of physician wear and health professional wear. So the coat that I got was called the Laennec iPad lab coat, so here's our technology connection to it. So it's a 40” length, so it's not the super long 44” one, which is good for shorter people like myself. It's a really well designed coat in terms of being very tailored and fitted. They do recommend that you buy exactly what your size would be in terms of like a suit coat fitting. Where you would get some off the shelf suit and to not try and buy one purposefully larger or smaller. It's coated with a special Teflon type of material. So yes, I am now the "Teflon doctor." Which actually does a pretty good job of repelling stains as I found out pretty recently. The good part about it is that it has a lot of pockets that are not very obtrusive but are able to hold quite a few things. The two outer pockets in the front are actually made for iPad, at least the 10” iPad, that you can put in there pretty comfortably as long as your case is not too big. And it slips in right there. And it's great for someone like me that takes the iPad in and out of the examination room. That you don't have to worry about dropping it because it's in a nice holster basically built into your coat. As well as a lot of other pockets that are accessible both to the outside and inside of your coat. It also has the vents inside to access your pockets as well. And a separate smart phone pocket inside the front right pocket along the side of the lab coat. "And it's great for someone like me that takes the iPad in and out of the examination room." 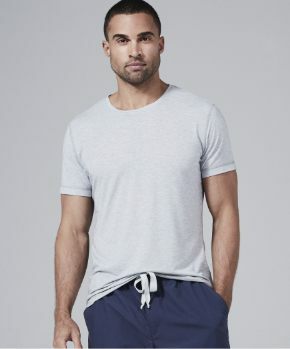 So really comfortable, very well tailored. The only thing I had to do was get the sleeves hemmed a little bit by my local tailor here. That really wasn't too much of a big problem. Just kind of a minor adjustment. But everything about it else it just fit as any sport coat I bought. And to me it makes me feel and look more professional. So I bought one that was purposefully not embroidered with my name because you cannot return it if it is embroidered. But I think the next one I get will probably get my name embroidered onto it though. They recommend that you can either dry clean it or you can wash at home. And regarding any working stains they do sell a stain removal kit that you can get. But it is pretty well designed in repelling stains through its Teflon material. So the cost of it as you may be wondering is not cheap, it is $138.00 on the website. But you know, my arguments like if you're going to go and pick up a sports coat at the local department store, if you are a man you may pay that amount or even more for a good sports coat. This is something which you're going to pretty much be wearing every day as your uniform. And the cost of it and the cleaning of it - you can deduct that out of your taxes as kind of a work related expense. You're not going to get the $130, 100% back, but you will get a percentage of it back out of taxes. So it is a work expense. But for any who are interested we'll put links in the show notes to it though. And I definitely intend on getting a second one probably at some point. If this one starts picking up too many stains. It is everything I wanted in a lab coat ever since I started medical school and more.  So if you are interested please check them out, this is medelita.com. You guys said you don't actually wear lab coats right? --Nope, no one in our office does unless they get cold. And I run hot so I never wear one. ---I never have, however my new job both the partners wear white coats the office manager tells me. So I told her to order me up a white coat just like theirs so I, I don't want to stand out. Hopefully you're not as challenged as I am in finding one that fits. Excellent, well thank you very much. They do look quite nice. I'm checking out the website now they do look a lot nicer than the ones we typically buy. I think I’ll have to...If I end up wearing this other one I've gotten on a regular basis I may have to order one of these nicer ones. The reviews are stellar, they have like 36 reviews on this particular model I was talking about. And there's just glowing reviews, just left right and center. It's really hard to appreciate on the picture on the internet, but the fabric is really very, very nice. "It's really hard to appreciate on the picture on the internet, but the fabric is really very, very nice. " 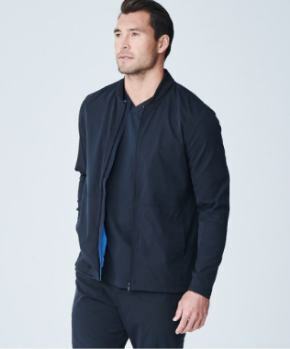 It looks a lot more like a sports coat quality fabric cut in a way versus the cheap ones you typically pick up at the local store look like something the lab boy's been wearing three days in a row. It doesn't have that resident funk to it that you are so used to seeing and smelling everywhere. Alright, well thank you for sharing. " Visit the Rheumatologypodcast for the full episode.